So here I am quite chuffed with myself after having just finished cooking the second risotto I’ve ever made in my life. After having blown up a microwave cooking 2 minute noodles, and burning various pots and tea towels in my bachelorette days it’s no wonder I was labelled a disaster in the kitchen. Hell, my mum even laughed in my face when I asked her how I could reheat up instant lasagne sheets as a meal. But after a few good years of perseverance and practice I might now actually be getting better at this cooking business after progressing beyond the ol meat potatoes, and veg to start to combine ingredients in this tasty creation. Keeping in mind I needed to create a carb and protein heavy meal this evening, I remembered an appealing recipe I had spotted on the back of a Vegetable Stock carton I had in the fridge. A Roasted Pumpkin and Spinach Risotto perfect for carbing up the night before an event just like the City to Surf. With no meat listed as an ingredient I decided I would add some diced up chicken thighs for protein and after cooking the meal as per the recipe it surprisingly turned out pretty good and with all tea towels and pots undamaged. The boss man Dean said I can ‘cook it again anytime’ which considering he’s my harshest culinary critic is always a sign that it really is good and tasty. Preheat oven to 200 deg Celsius, and place diced pumpkin onto roasting tray and toss through 1 tbsp of olive oil. Put tray in oven and roast for around 20-30 minutes until tender. Place stock into a saucepan and bring to the boil then reduce heat to low and simmer to keep warm. Using a non stick frypan cook chicken over medium heat until tender and juicy. Keep chicken aside. Heat remaining oil in another saucepan over medium heat. Add onion and garlic and cook for 5 minutes, add rice and stir to coat with oil. Add 1 cup of warm stock to rice. Stir constantly until stock has absorbed. Continue adding stock, 1/2-1 cup at a time stirring after each addition until stock is fully absorbed and rice is sticky. 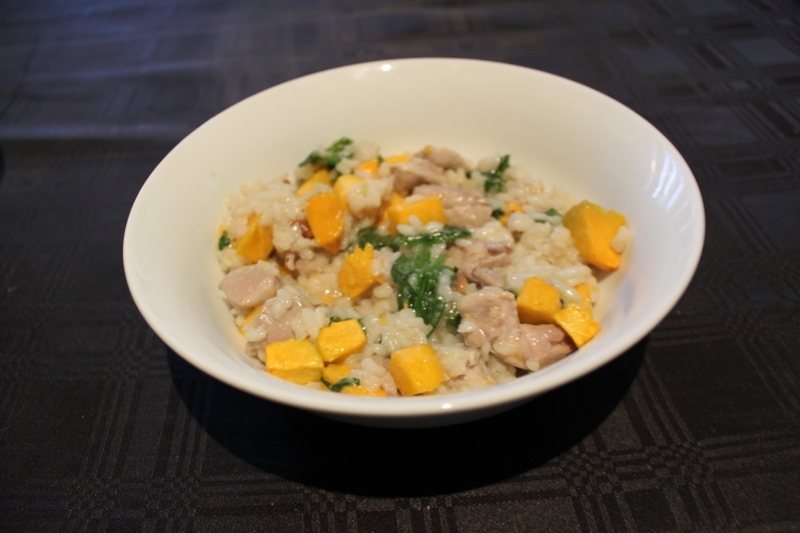 Once all stock is added & rice is tender, stir through spinach, chicken, parmesan, pinenuts and roasted pumpkin.